Hans Luger was born on Feburary 2, 2012. We picked him up in March of 2012 and our lives changed forever. He is a such a baby he loves to play frisbee in the backyard and loves to have his tummy rubbed. He plays all the time whether he is in the house or outside. He trots likes a horse and runs like a gazelle. He is a very loving and protective guy and will protect his family and his friends. When we play tug he pulls us across the room. He is our best friend. I am so glad to see all the wonderful pictures of your handsome young German Shepherd, Hans Luger. He is one cute little fella! And quite a camera hog too it seems - he's very photogenic! It is always so nice to see a range of ages in pictures when people write in about their own dogs. And I really enjoyed all the great German Shepherd pictures you included here. We got to see him as a puppy and then all the way up to a teenager. Very cool! 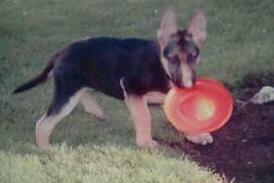 And it is so good to see him playing with the frisbee. I don't get a lot of pictures showing GSDs playing frisbee. But he looks like he's having a great time. I wish you nothing but the best with Hans in the future (or do you all him Luger). He is a fine looking boy and I am sure that he loves his family a lot. 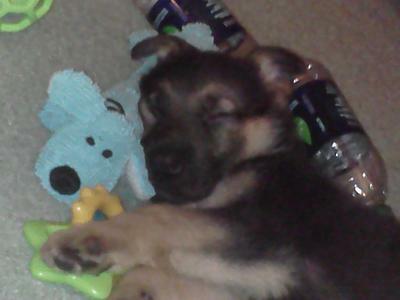 And as always, you know it for a fact, German Shepherds Rule! What a Beautiful baby Hans! Look at him getting bigger and stronger. He reminds me of my Mia when she was a little puppy! 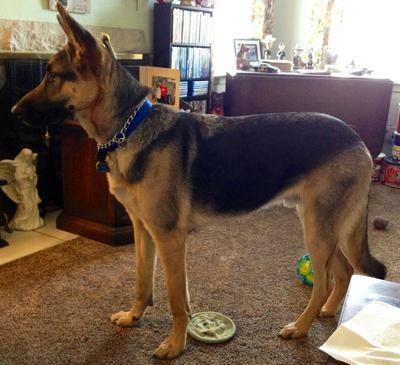 Glad he has a loving home and a great family who truly appreciates the German Shepherd breed. 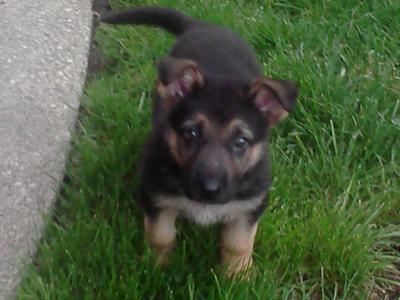 He will grow into his adulthood and will be very Loyal and Protective. Take care of your boy and he will take care of you!